Cleveland BioLabs, Inc. (Stock Symbol: CBLI) live interview, small cap stock news, biotech medical stocks to buy will be featured on the Money Info where to invest now radio show. The September 9 Money Info radio show will feature stock market news today, biotech medical stock news and September 2014 best stocks to buy. The show will include small cap stock news, medical stocks to buy and a live interview with Rachel Levine, Vice President, Investor Relations of Cleveland BioLabs, Inc. (NASDAQ Stock Symbol: CBLI). The investment news radio show airs 10 AM to 11 AM EDT every Tuesday. Investors can be on the air by calling in questions to 888-792-1590. 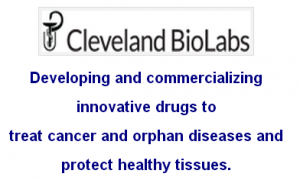 Last week Cleveland BioLabs (CBLI) stock price soared over 44% on news of a “Green Light to Submit Pre-Emergency Use Authorization Application for Entolimod”. 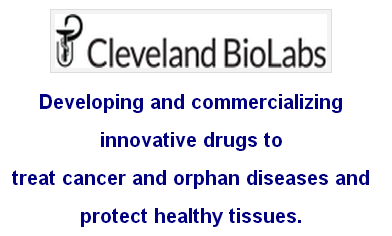 On September 3, 2014 Cleveland BioLabs, Inc. (NASDAQ:CBLI) announced that the minutes from its meeting with the U.S. Food and Drug Administration (FDA) in July confirmed that the Company’s existing efficacy and safety data and animal-to-human dose conversion are sufficient to proceed with a pre-Emergency Use Authorization (pre-EUA) submission for entolimod for reducing the risk of death following exposure to potentially lethal irradiation occurring as the result of a radiation disaster. Money Info show features where to invest now, stock market, business, economy and financial investment news. Money Info is hosted by Mike King and Charles Moskowitz. 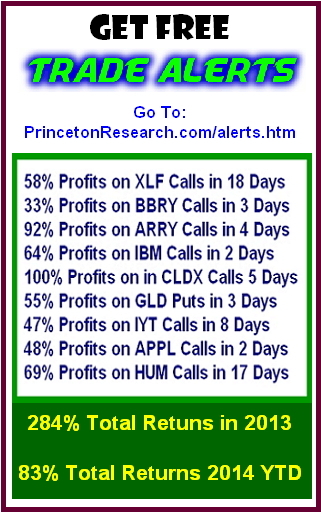 Princeton Research, Inc. has announced significant investing profits performance produced from their options trading strategies text message investing alerts, small cap stocks featured on their Money Info Show and the best stocks to buy, stock market news Market Investing Strategies newsletter. To make more investors aware of their where to invest now and options trading text message trade alerts subscriber services, Princeton is now offering access to sample Market Investing Strategies newsletters and free trade alerts. The free offer is limited to 100 people. To sign up today for complimentary access investors can go to the Princeton Research website links above.